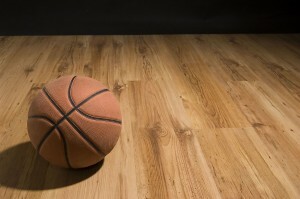 Basketball one of the most popular sports not just in the U.S., but worldwide. It’s not just a sport for the pros, either—millions of people of all ages and skill levels play basketball. It’s a fast-paced sport that can cause a wide range of injuries. Most basketball injuries, however, fall into one of two categories: overuse injuries and traumatic injuries. Overuse injuries are common in any sport. They are the result of repetitive stress on a muscle or joint until the area is damaged and the individual begins to feel pain. Patellar tendonitis, or “jumper’s knee,” is one example of a common basketball-related injury. Achilles tendonitis is also common in basketball. This injury affects the tendon connecting the calf muscle to the heel. It’s not just the knees and ankles that are affected by overuse injuries. Many basketball players also suffer overuse injuries in their shoulder, particularly in the rotator cuff. The rotator cuff is composed of all the muscles and tendons in the shoulders. Ankle sprains and knee injuries are two of the most common traumatic injuries for basketball players. The fast-paced sport requires start-stop action as well as frequent changes in direction, all of which can result in a traumatic injury to the ankle or knee. A sprained ankle happens when the ankle rolls too far outward, stretching or tearing the ligaments in the ankle. A torn MCL or ACL in the knee are more severe (yet common) basketball injuries in which the ligaments in the knee can be damaged or torn. In many cases, a torn MCL or ACL requires surgical repair. Jammed fingers, broken fingers and pulled muscles are more minor injuries related to basketball. If you love playing basketball, don’t let an injury sideline you. Here are a few tips to help you avoid one of these common basketball injuries. Stay fit. People of all fitness levels can play basketball, but the more fit you are, the less likely you’ll be to suffer an injury. This is especially important during the off-season. When you’re not playing basketball, be sure to participate in a balanced fitness program that includes cardio/aerobic exercise, strength training and flexibility. If you are out of shape when you first start playing basketball, take things slow and allow your body to build to a higher fitness level. Warm up and stretch. Muscular injuries are often the result of cold, tight, stiff muscles. Take plenty of time to warm up and stretch before you hit the court. Take about five minutes to do jumping jacks or go for a light jog or a brisk walk before the game begins. Then spend some time stretching all the major muscle groups before playing. Stay hydrated. Dehydration can hurt your performance, so be sure to give yourself enough fluid to allow the body to cool itself through sweat. As a general rule, drink 24 ounces of water or non-caffeinated fluid before exercising, and drink an additional eight ounces of fluid every 20 minutes while exercising. Practice technique. Using correct form is important in preventing injury. Coaches can help their basketball players learn proper technique, but what about those simply playing a pickup game? It wouldn’t hurt to take some lessons from a basketball expert to ensure you’re using good technique when playing basketball. Use the right equipment. Shoes that are supportive, fit snugly and have a non-skid sole are the best for basketball. If you tend to have weak ankles, consider wearing ankle supports to prevent an ankle injury. Protective knee and elbow pads can lesson the blow in the fall, and a mouth guard will protect your teeth and mouth. If you wear glasses, be sure your lenses are made of polycarbonate, or use safety glasses to protect your eyes. Play in a safe environment. If you’re playing outdoors, take a few minutes to clear the court of any rocks, sticks or other debris. Don’t play on a court that has holes or other potential hazards. The court should also be properly lit in the evening. Avoid playing outdoors in extreme weather. Keep goal posts and the walls behind them (on indoor courts) padded, and ensure boundary lines are a safe distance from walls, bleachers and other structures. If you suffer an injury while playing basketball, get checked out by your doctor before returning to play. Even minor injuries can become serious if not treated properly.